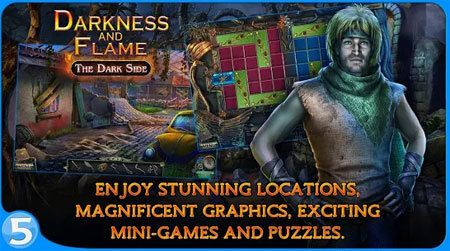 Darkness and Flame 3 is a hidden object adventure game developed by Five-BN Games. Alice recovers consciousness and finds herself behind the Great Fissure where regular people have not been able to get for a few decades already. She has to find her closed ones before the magic power leaves her forever. Travel together with young Alice about dark lands and deserted settlements, caves and oases of the Desert of Death. You are to get to the very heart of the deserted lands and cope with numerous challenges, avoid the traps and hide away from the Darkness. Get acquainted with the lucky survivors on the deserted lands. Solve lots of incredible puzzles. Gather amazing collections and find dozens of morphing-objects. Enjoy stunning locations, magnificent graphics, exciting mini-games and puzzles. If you get stuck in the game, check out the video walkthrough and gameplay for the game. This entry was posted in Android and tagged Darkness and Flame 3 Cheats, Darkness and Flame 3 Gameplay, Darkness and Flame 3 Guide, Darkness and Flame 3 Solutions, Darkness and Flame 3 Strategy, Darkness and Flame 3 Walkthrough by Marvin Tang. Bookmark the permalink.